Christian Bookmobile: COTT: 2013 Laurel Award, Opening Soon! 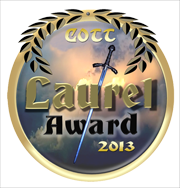 COTT: 2013 Laurel Award, Opening Soon! Love Lives On – The Reviews Are In!